Four years into their careers, NBA first-round draft picks are allowed to become free agents. Except it's not quite that easy, and various rules restrict their ability to play wherever they want. For instance, they're allowed to accept a qualifying offer after the fourth season, at which they point they must play one year before becoming unrestricted free agents. If they don't take that offer, they can sign offer sheets with anyone with the cap room to do so, though their current teams have the option to match any deal. These are common rules known to every player and franchise, and even most fans. Nevertheless, players often get upset when they're not allowed to go exactly where they want. 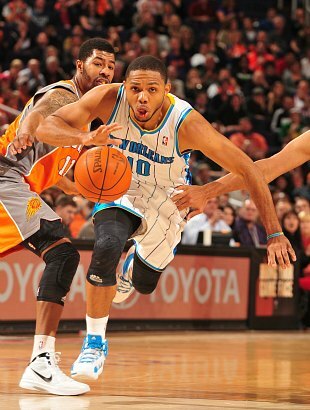 New Orleans Hornets guard Eric Gordon, who reached a four-year max-level offer with the Phoenix Suns on Tuesday, really doesn't want to return to New Orleans despite the fact that they've made it very clear that they plan to match any offer for his services. "If (the Hornets) were interested, there wouldn't have been no tour, there wouldn't have been nothing," Gordon said. "There's been no negotiations. I was right there in Indiana. I haven't received no calls, to me personally, they've contacted myagent. "As for now, I don't know what's going on. (If the Hornets match) as of right now, I'd be disappointed." Is there anything the Hornets could do to change his mind? "I don't think there is," Gordon said. "If you feel that I'm that caliber player," Gordon said, when asked if he felt disrespected. "You don't think I knew I was going to be an unrestricted free agent this summer? [BDL Note: Gordon seems mistaken here but later makes clear he knows he's restricted.] I knew that. I took it into account. I'm taking accountability for how I play. What do they mean as an organization? What do I mean to them? "I'm a basketball player at the end of the day. Where I'm at, I've just got to play ball. But as of right now, it's going to be for the Phoenix Suns. If they match, I've got to play basketball." And who can blame Gordon for his choice, right? Why would anyone want to play in a cultural hotbed with Anthony Davis when he could live amongst Phoenix's many Sonic locations and share the court with Michael Beasley? It's an easy choice! All joking aside, it's easy to sympathize at least a little with Gordon's state of mind. The constrained freedom of restricted free agency can be a bizarre experience, particularly for a player who's played just nine games for the team in question. When Gordon was traded to New Orleans as part of the Chris Paul deal last December, he was thrust into an awkward situation. His knee injury in 2012 only complicated matters. With the Hornets intending to match this deal, he'll be forced to play for a franchise he barely knows for four years. If management hasn't reached out to him as hoped for, it's understandable that he'd feel uncomfortable. In these circumstances, the Suns' money and Arizona's lack of state income tax might look really attractive. But that decision didn't come without consequences, and acting as if New Orleans had done him wrong smacks of immaturity. There are legitimate arguments to be had about the fairness of restricted free agency and whether or not traded players on their rookie contracts should have to play by the same rules. Unfortunately for Gordon, these rules do exist, and the time to argue about them passed during collective bargaining negotiations. Gordon wants to feel loved by his team, and that's totally fair. Yet he's still likely to play for the Hornets, and making a public stink about how they've handled this process doesn't exactly create the best work environment moving forward. Like it or not, Gordon had a year to plan for this state of affairs, and his decision not to sign a four-year, $50-million extension in January suggests that he was very aware of what could happen this summer. The Hornets are not acting out of turn here, though they could be a little friendlier. Gordon has made his own choices about how to become a free agent. Those decisions come with a certain amount of responsibility and self-awareness, even if the system in which they operate isn't entirely just. He might not want to play in New Orleans, but the rules he's agreed to say that he has to. Complaining about that in public is only going to make him look worse.